Shas chairman calls on opposition leader to join the government. Herzog responds and calls on Deri to join alternative coalition. Interior Minister Aryeh Deri (Shas) on Tuesday evening called on opposition leader and Zionist Union chairman Yitzhak Herzog to join the government. "In light of the challenges facing the State, Herzog and his party must join the government," Deri wrote on Twitter. The tweet came hours after Herzog and Deri met and spoke during the Bar Mitzvah celebration of the son of the Director General of the Negev and Galilee Ministry, Ariel Mishal. 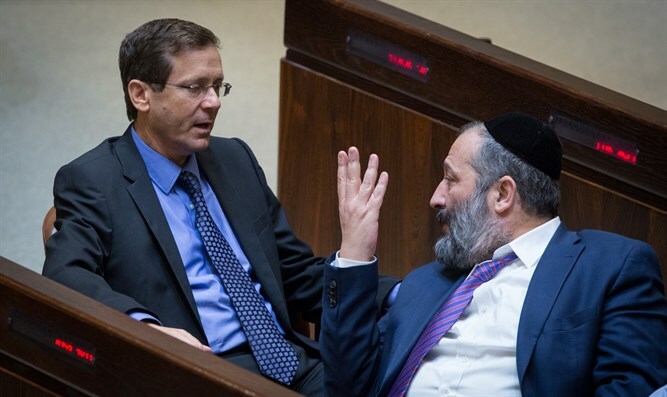 Herzog later responded to Deri’s tweet and suggested that, instead of him joining the coalition, Deri and Shas should join an alternative government that he will form. "Come and join the alternative government, that's the right way for Israel," Herzog tweeted. The exchange of tweets between Deri and Herzog took place amid the ongoing coalition crisis between Prime Minister Binyamin Netanyahu and Finance Minister Moshe Kahlon regarding the new public broadcasting corporation. Netanyahu is against the new Israel Public Broadcasting Corporation (IPBC) and would like the current public broadcaster, the Israel Broadcasting Authority (IBA), to remain in place. Kahlon and Netanyahu met for a third time on Tuesday evening in an effort to reach a compromise. The meeting lasted several hours but ended without agreement. Herzog last week announced that "in the last few days I am working on building a Zionist, centrist, rational bloc which will replace Netanyahu after elections or in the present Knesset. I suggest to skeptics and cynics from outside and inside [the party] to wait and see. The unexpected in Israeli politics is far more prevalent than the expected."